How would you describe how you write or how ideas come to you? Let me know in the comments! As a writer, I follow a lot of other writers on WordPress. I also follow a lot of readers. They read, like I read, but then they write a review. Sometimes we read the same things, and sometimes their book choices are vastly different than my own. And that’s a good thing. I get exposure to all the books I might not read, and that may end up on my to-read shelf on Goodreads. As I skim their reviews, sometimes I stop and wonder: If I got published, would they read my book? Would they read my essays or short stories? What would they think? Then I worry: Is that selfish? Is that selfish to think I’ll get published one day? Some of the reviewers I follow are writers, too. Who says which one of us will get plucked to the big leagues? Maybe, someday a query will get successful. Maybe, someday I’ll finish a novel, or write enough short stories for a collection. Maybe, someday one of my short stories will get published. This concept was taught to me by my professor and author, Diane Les Becquets. Writers come in two types: Diamond Polishers and Vomit Drafters. Vomit Drafters are writers that will write an idea the instant it comes into their head. They’ll write and write; every stream of conscious thought and plot until they can’t any longer. And then that’s it. That’s their story. They’ll edit their work, but perhaps they won’t cut too much out. Maybe they’ll fix the mechanical errors. But otherwise, to them, this draft is gold. Diamond Polishers are writers that will labor over every. single. word. They will spend hours on a single page, or a single sentence. It could take a Diamond Polisher months to produce a single piece because they have it so fine-tuned. Now you might be thinking that these two categories are a harsh way to divide writers. And maybe you’re thinking about which category you fall into. Is there one inherently better than the other? You see, there’s nothing wrong with either way. In fact, its important to continue doing what works best. We’re all individuals so what works for you might not work for another writer. But there are things to keep in mind for both types. A Vomit Drafter needs to keep in mind that they might write a lot. But that doesn’t necessarily mean that the quantity is better than the quality. More words won’t make your story better. Vomit Drafters will need to edit down their work more thoroughly. They might need to refresh themselves on grammar and punctuation rules, or know when to kill their darlings. A Diamond Polisher needs to keep in mind that while what they produce will already be finely tuned, their process might take longer. They might want to start working earlier than most on their piece. This will ensure them ample time to mull over the closing lines of their short story, or the beats leading up to the climax. In the middle of class while jotting notes, an idea strikes. Does this plot bunny go before Herbert Hoover, or after, in the section for the Great Depression? At least if its there I’ll know where to look when I have writers block. So many of my spiral notebooks get doodles into the margins, or small to-do lists for my day. A greater number get marked with tidbits of dialogue, or maybe a strange anecdote that could be important for character development. Or to help create a character. The biggest problem becomes when I have a short story due and my nearest idea is on the other side of the drift. And of course these notebooks are nowhere to be found. When I still lived at home, I’d put my ideas on post-it notes in a small box. They’d live there until perhaps it cropped up again, only this time attached to more than just its paper. I’d get lucky and there was a whole story clutching on to it for dear life, waiting to be written. This idea worked out so well, I started doing it in college, and its worked so far. Maybe not as well as I would hope since occasionally the post-its fall off and land in that black hole behind my desk (actually that space is rather clean). Now I’ve resorted to scotch tape, and when I remember it, Facebook messaging myself the idea. 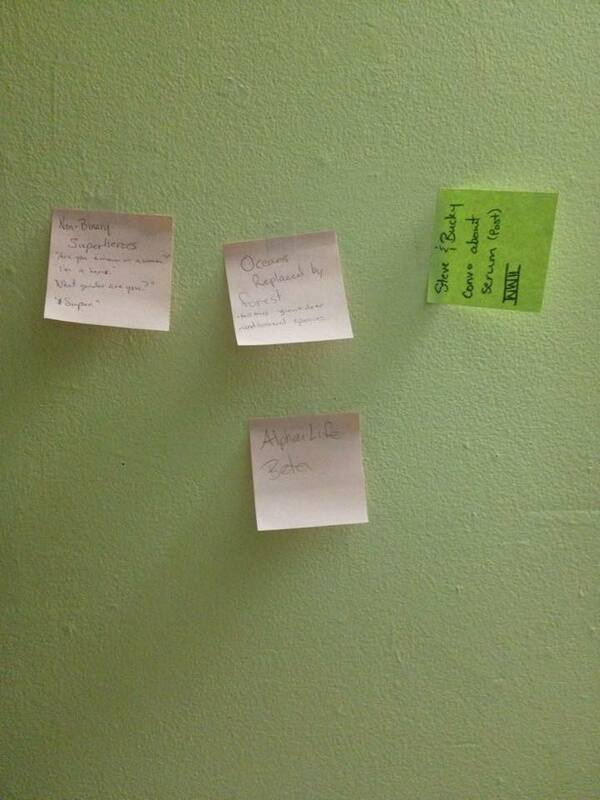 At least then it will live somewhere other than a pink post-it on my wall. The larger ideas get to live somewhere fresh. For my most recent thought vomit, I’ve put up a piece of butcher paper above my bed and wrote about a single idea. Its every possible question I and some close friends have come up with in relation to a story idea noted in one of the pictured post-its. I’ve garnered more strange looks for the paper on my wall than the post-its; which makes sense given the fact the paper is a large section of my wall with questions and thoughts in thick black marker. How do you like to keep track of your plot bunnies? Do you put them in the corners of notes, or napkins? Or is there a specific system that you think I should employ to organize my various ideas? I’ve spent a good portion of my life stringing words together. And while not everyone enjoys that task, I have a deep passion for being a wordsmith. During a writing course at the community college I previously attended, we read Hemingway’s A Clean, Well-Lighted Place. Immediately I saw the beauty in making every word count. There’s something pleasant about sparse prose that keeps me reading. I don’t know how to describe it. After reading a few more Hemingway shorts, I gave myself a challenge. Push my style and my language. Don’t just string words together, but explore storytelling in a minimalist fashion. Make every word and every sentence matter. And I suppose its worked. My nonfiction essays have grown shorter, until my last one was barely over a page. Maybe there are details I’m leaving out. Only way to know if this is working for me is when I start submitting my essays for publication.